For HackSheffield 2.0, we designed a video game to fit within what we felt was realistic ambitions. We drew artistic inspiration from games such as "Gods Will Be Watching" and "The Secret of Monkey Island" - and loosely based our primary game mechanic on... "Papers, Please" and... maybe "Guess Who"? With hindsight, the game turned out rather similar to Sheffield's Assassin's Guild society - and as two of our developers are indeed members, this is PROBABLY not coincidence. Call it subconscious game design, or whatever floats your boat. 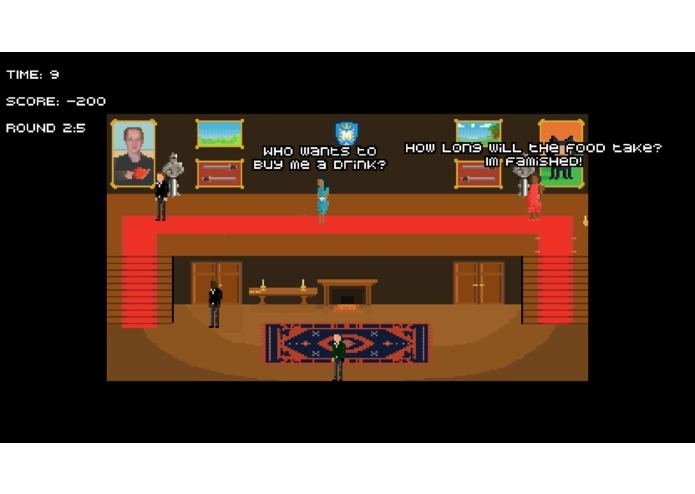 "The Dossier" was a game designed to combine the talents of our four developers. We decided on a video game, as this is where the majority of our cumulative experience lies - video game development. Rather than limiting us, this let us draw from a dauntingly vast pool of disciplines that making a decent game requires. Artwork, programming, web development, and creative writing - we split our team of four rather neatly into these four different categories. 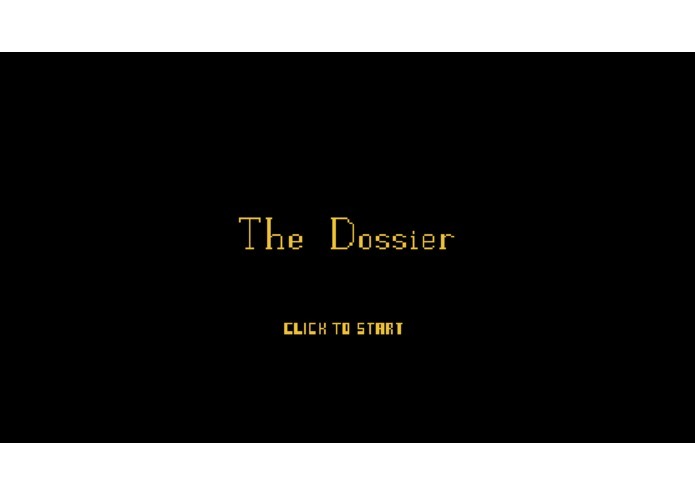 The Dossier features intrigue, espionage, and pirates. Put simply, there's a load of characters in a room - one of whom is your "target". Equipped with a rather vague "briefing file", along with each character's dialogue and appearances, you are tasked with identifying your target correctly. The quicker you make a correct identification, the more points you score - and after five rounds of investigation, your score is uploaded to an online leaderboard. We've also got functionality to post your score to twitter, because social media. 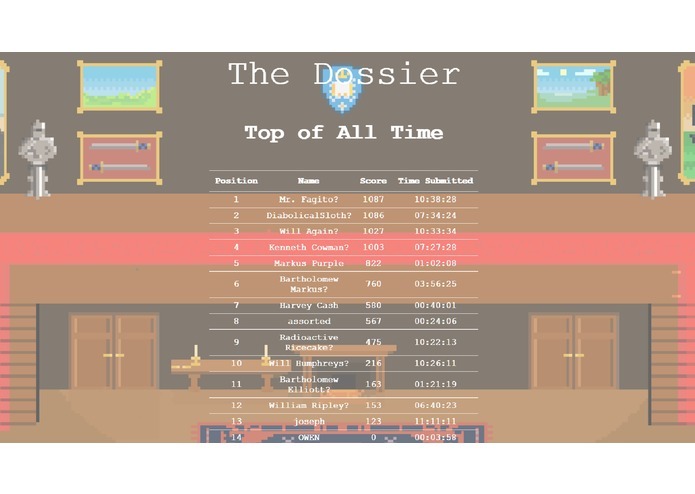 Last but by no means least, we used HTML, CSS, and PHP to get the online leaderboard up and running. Coding wise, matching up the sprite animations with the character movement, alongside varying the game with each play (random characters chosen from a pool of possibilities), proved to be something of a timesink. Regarding asset creation, the large workload for a project of this nature made it difficult to produce content fast enough. We were able to overcome this through re-using many of our assets - modifying the originals to make them unique. Finding a web hosting service proved tricky, to say the least. This, combined with a mid-hackathon fresh OS install, set the leaderboard development a little behind other aspects of the game. All of us on the team, having never worked together before, were able to successfully meet the workload of the game we designed from the beginning. It was stressful at times, and plain tedious at others, but we unanimously pulled through and were to deliver a game that lived up to our expectations. The most significant thing we learned was that: allocating roles is effective. The four of us worked on very different, equally important aspects of the project, but maintained communication throughout. In this way, we made progress on our individual tasks, whilst helping each other and making design decisions as a group. Whilst we don't intend to continue developing The Dossier, we certainly learned a lot from its development, and find it likely that we'll collaborate again on a future project. I produced all assets in Krita, including character sprites, the background image. The art style was somewhat inspired by Gods Will Be Watching.